If that didn’t make you want to stay in tomorrow night, cook dinner, and watch a movie while drinking wine and wearing Uggs, I don’t know what will. That’s my reaction to yummy gooey spicy rice, anyway. I made this a few weeks ago when my grandfather generously gifted me about 837 servings of kale from his garden. 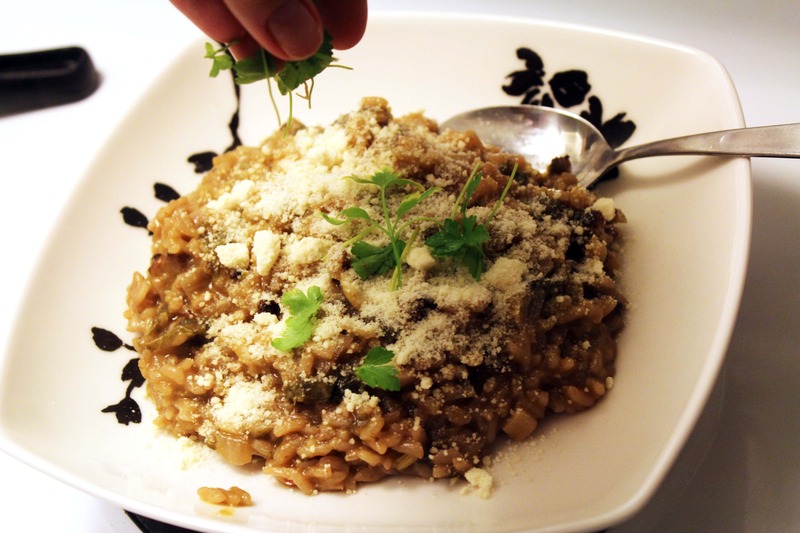 I made braised kale like I did at thanksgiving one night, and then made this risotto with the rest. 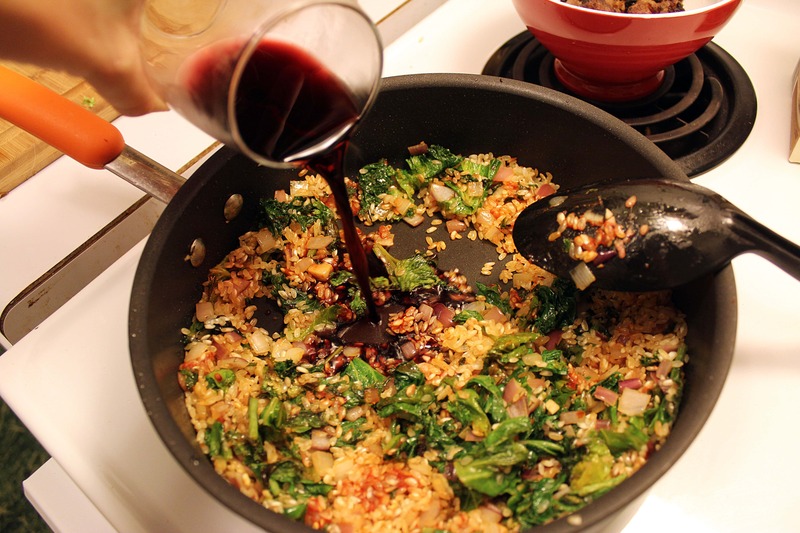 The basics of this are just like other risotto: rice, onion, garlic, wine, stock, and whatever flavorings you like. It’s delicious! 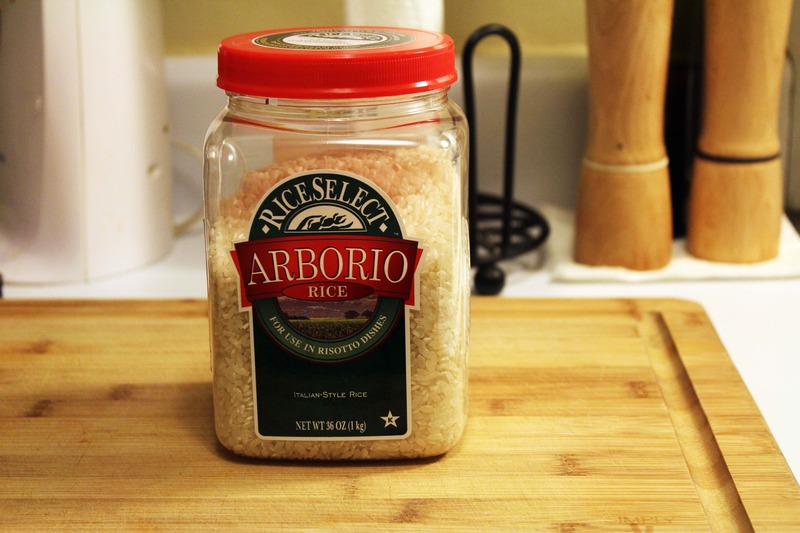 The rice is a teeny bit pricey, so grab some if you ever see it on sale. I’ve also seen it way discounted at Big-Lots type stores – a great bargain place for non-perishables! First, heat a pan to medium-high heat. 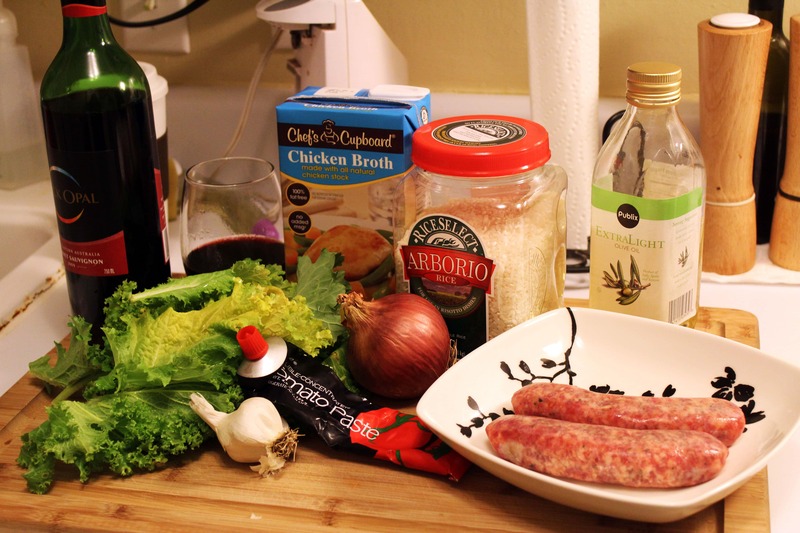 Remove the sausage from the casings and brown it in the pan for 10 minutes with a drizzle of olive oil. 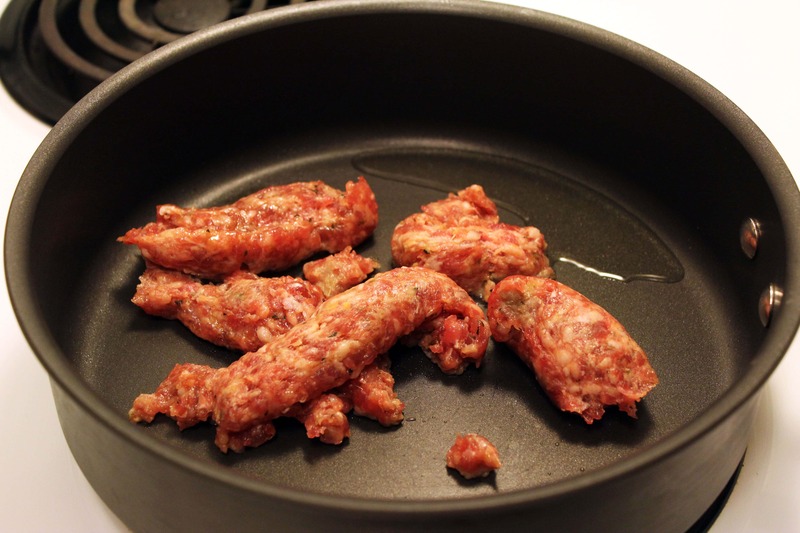 As you’re browning the sausage use a wooden or plastic spoon to break it up into little bits. When they’re all crispy and delicious and cooked through remove the sausage and reserve them in a bowl. 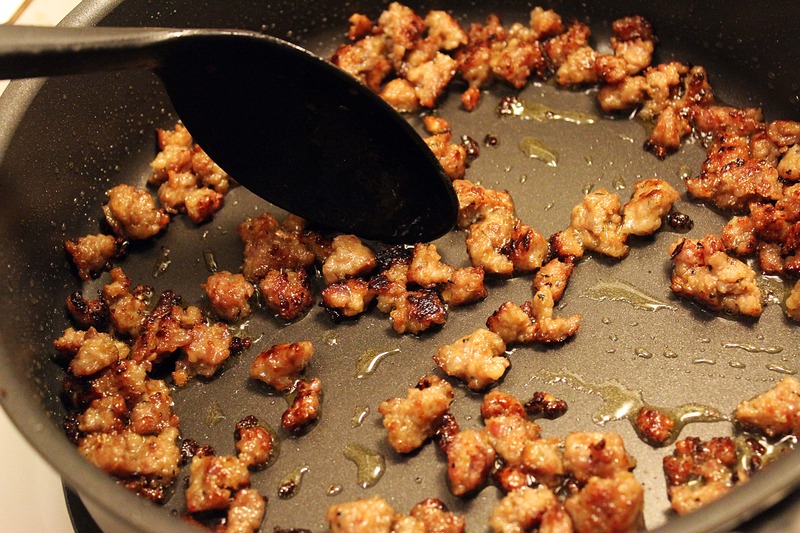 Leave the olive oil and sausage drippings in the pan! 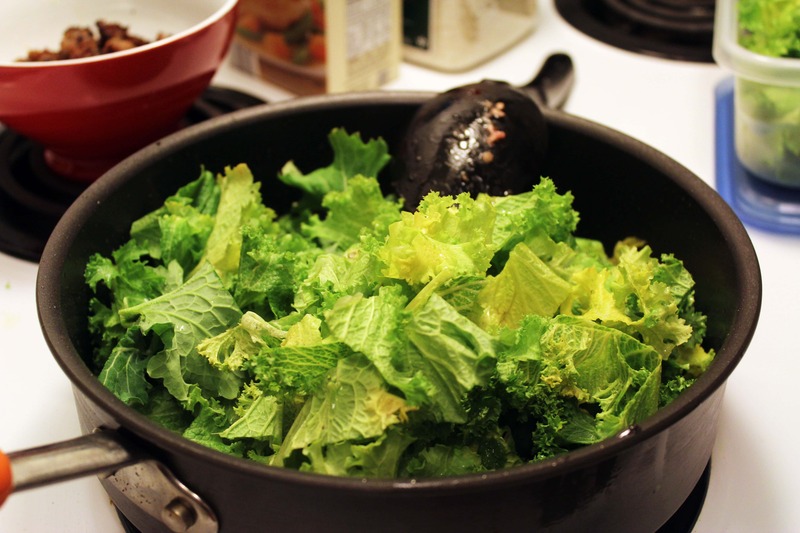 Then, tear the kale into large pieces and add it to the sausage-flavored pan. Yum. See the sausage in the bowl? I told you to reserve it! Do that. Wilt the kale for just a minute or two. 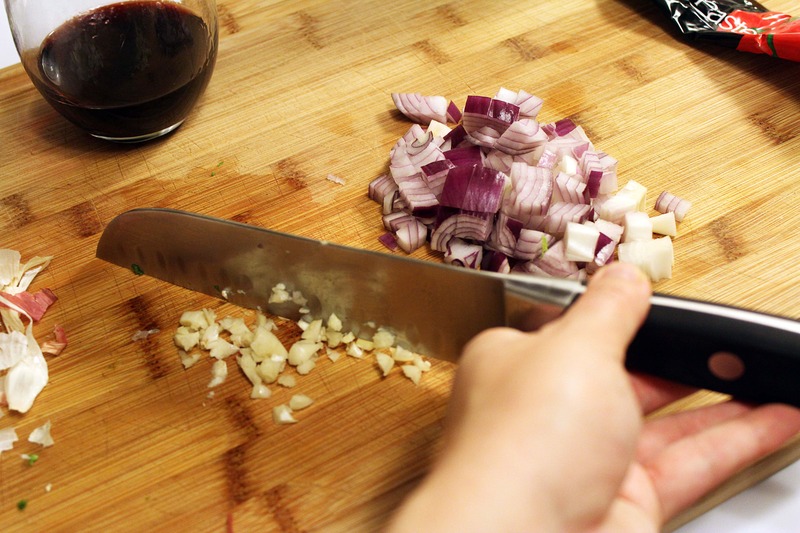 While you do that, chop the onion and peel and mince the garlic. ….and go ahead and start drinking. You’ve earned it after the effort you put forth to brown that sausage! 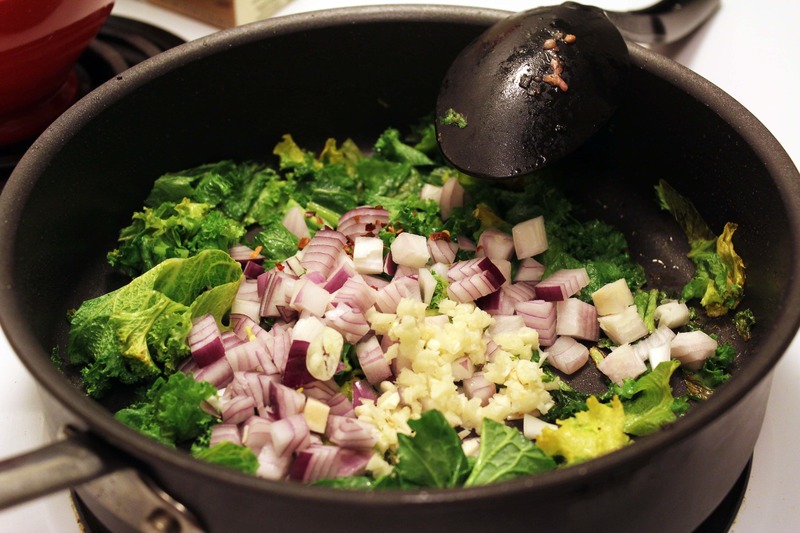 When the kale has wilted just a bit, add the garlic, onion, and a sprinkle of salt and red pepper flakes to the pan. Delicious! Now, stir this around for 2 minutes until the onion and garlic starts to soften. Then, dump in the rice with another drizzle of olive oil. Fab. 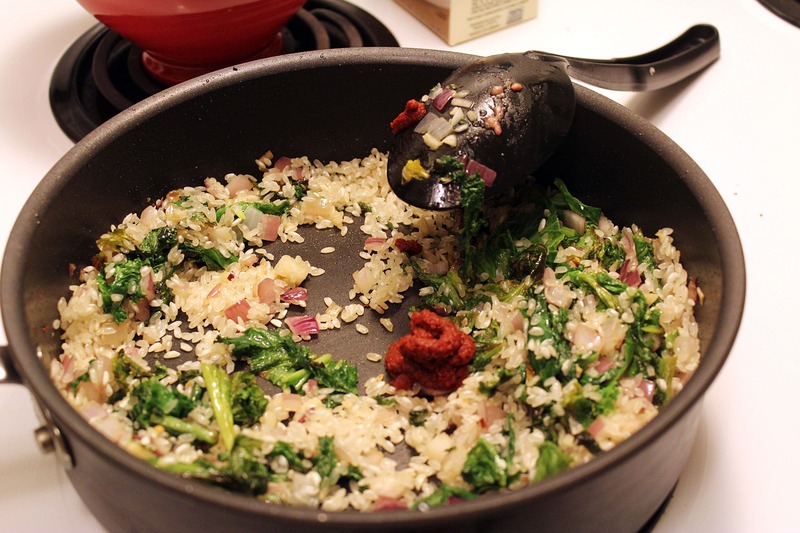 Stir the rice around for a minute to get it coated in the oil, then add the tomato paste. Then stir THAT around, and when the tomato paste is well-mixed with the rest of the ingredients dump in the wine. I used red, but you can use white if you’d like! I won’t be offended. Nice, and you know what’s next! Stir this around until the wine is nearly gone, then add water and stock 2/3 cup (or so, don’t obsess over it) at a time until it’s absorbed, then repeat. Switch up the stock and water to save money and salt and calories. Or use all stock – whatever works for you! 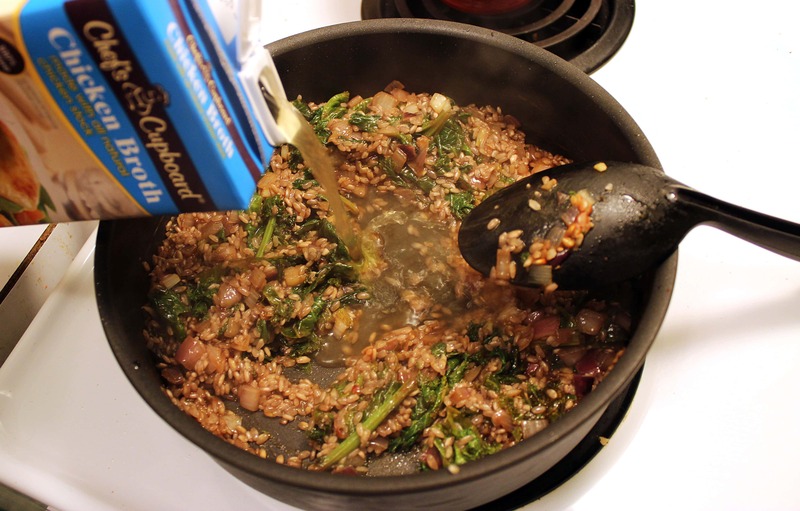 Each time you add liquid stir and stir and stir to break up the starch in the rice and make the risotto really creamy. The stock/water portion of this takes awhile, so be patient! 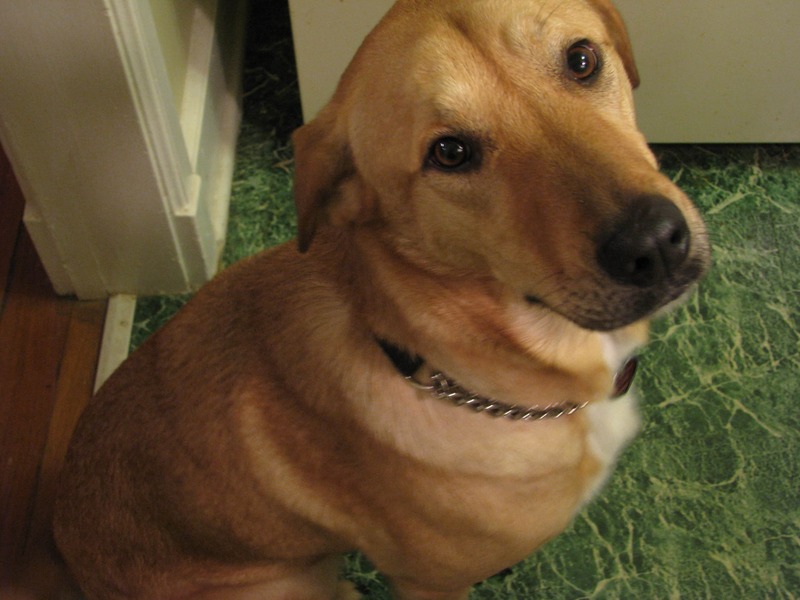 You can talk to your dog about your dreams for the future if you get bored. Or not. 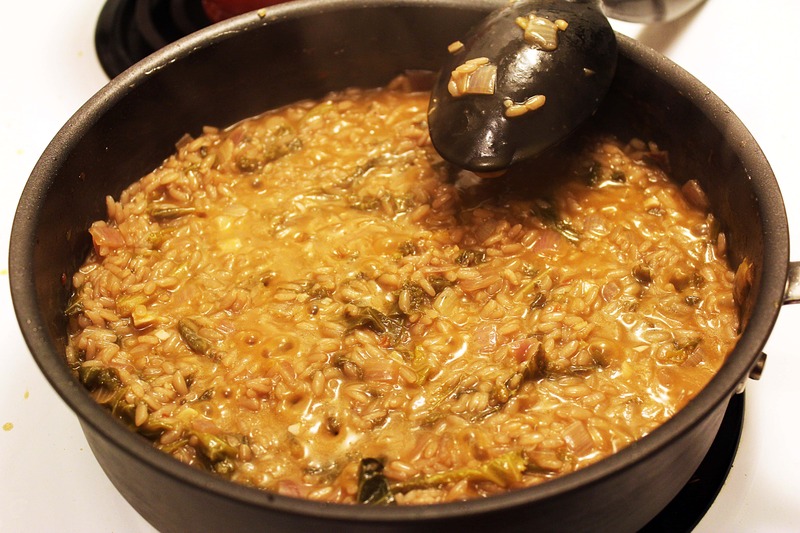 Once you’ve finished being a crazy person, taste your risotto and see if the rice is done. It’ll taste like…rice, rather than raw rice. Helpful, huh? See? The kale has wilted and the rice has plumped and all is right with the world. 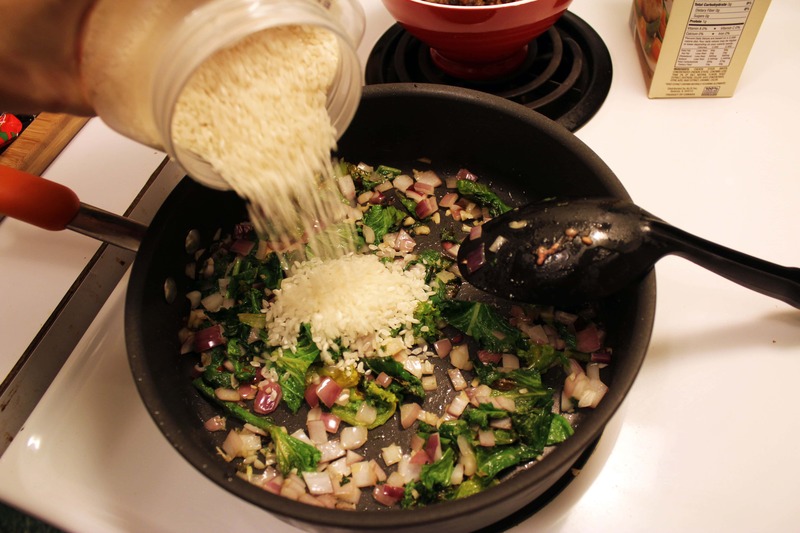 When your rice is cooked through, add 2 tablespoons of parmesan cheese, a pat of butter, and the sausage to the pan of risotto. Yum. Stir this all together and taste for salt – add more if you need it! Serve this topped with more cheese and fresh parsley. Have a great weekend, everyone! Your pictures are always so amazing! The risotto sounds delish. That’s a little more advanced dish, isn’t it? Definitely not! 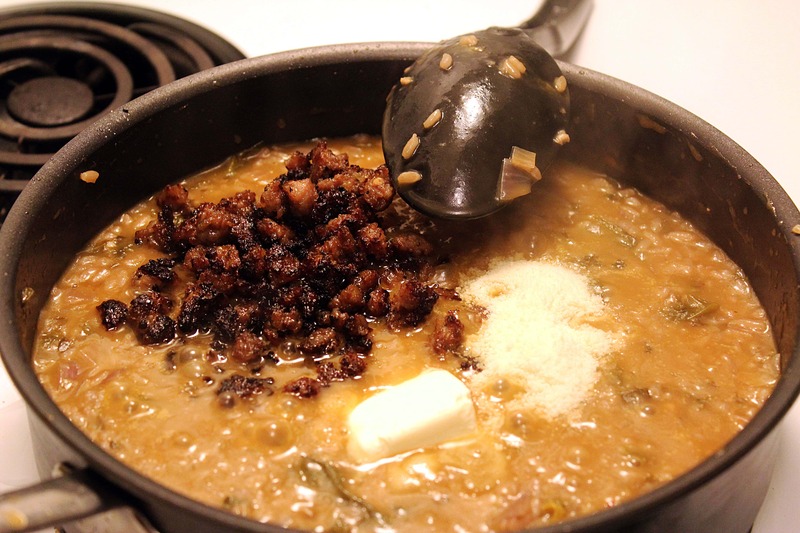 You just stir…really! 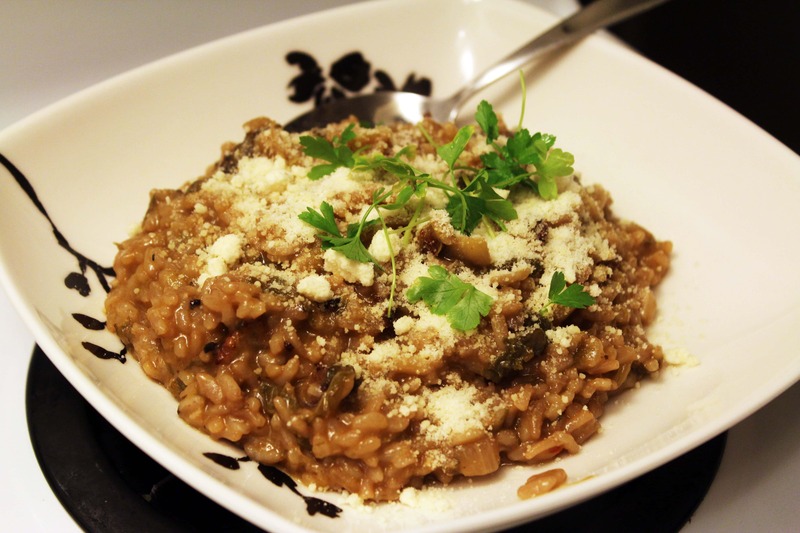 There are a few other risotto recipes on here, and as long as you’re patient and add the liquid bit by bit, then stir, then add more once it’s evaporated, and do this continually for 20 minutes or so, it’ll be perfect every time!